May 19, 2014 February 10, 2016 ~ Sara W.
This Friday, May 23, marks one year since my first post here on First You Must Begin! I have been planning this giveaway for a few months now and I am so excited that it’s finally here! Although, I will admit, I kind of want to keep the prize for myself. 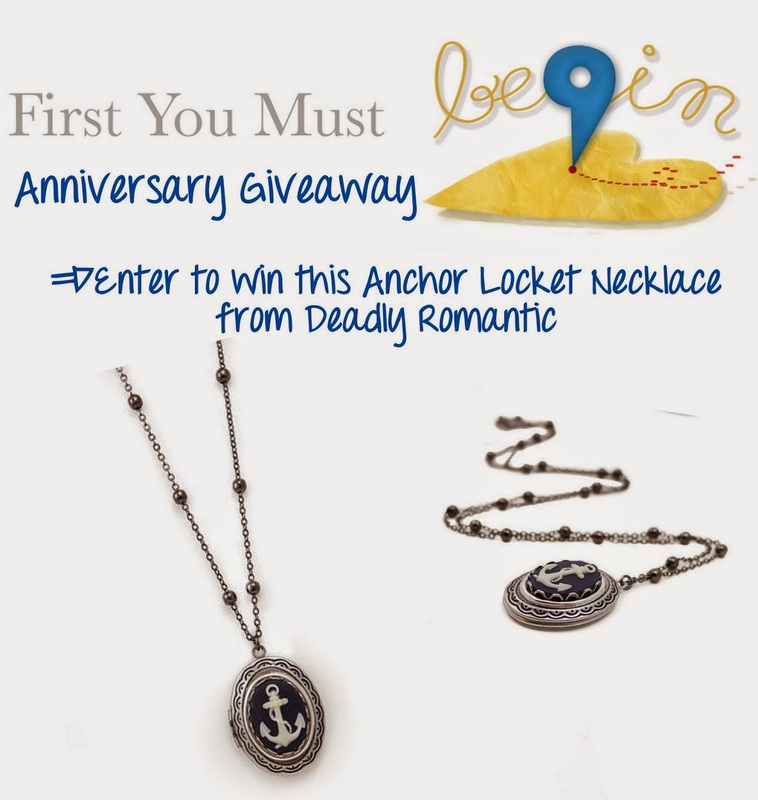 Thanks goes out to Deadly Romantic for providing this beautiful handmade Anchor Locket Necklace. I just love lockets and this one is particularly beautiful! Deadly Romantic can currently be found on Etsy, but I know her official website is in the works. You can count on a future First Friday Find, as soon as her website has the jewelry collection up for sale! Since this giveaway is to celebrate First You Must Begin’s one year anniversary, I thought it would be fun to enter the giveaway by sharing which post you enjoyed the most during this past year. If you feel so inclined to share our website with your friends, like us on Facebook, or pin one of our images, all the better! You may enter anytime between now and 11:59 PM PDT on Friday, May 23. Winner will be chosen on Saturday, May 24. I really enjoyed reading the Power of a Bucket List post. I’ve always wanted to make a bucket list and I love the list you posted! I have loved many of your posts, but I especially loved “You Do What You Value,” as it’s something I think about on almost a daily basis. I also loved the one that came after our birthday celebration that will never be forgotten. Thank goodness for the example of your husband and mine. While you have many posts that I’ve enjoyed and it’s hard to pick one, the one that speaks to me the most right now is Timing Is Everything. I’m trying to practice both what you wrote and what Aaron said. Congratulations on your anniversary!